This 7-night itinerary is a combination of three small, characterful accommodations in the northern fjord region. The properties are surrounded by charming communities, unspoiled scenery and are within a short drive of the primary attractions of the area: Ålesund, the Atlantic Road, the Geirangerfjord, Molde and Kristiansund. 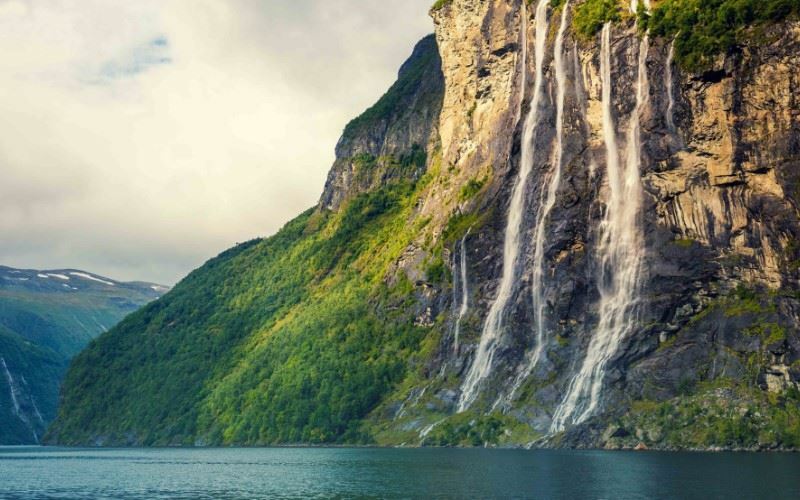 Discover an authentic part of the fjords that will not fail to impress. On arrival at Ålesund Vigra airport, collect your hire car and drive to the Storfjord Hotel in the rural community of Skodje. This is a delightful grass-roofed property that oozes charm and character. There are comfortable lounge areas with fireplaces, antique pieces and book-filled alcoves; an excellent restaurant and gardens with far-reaching views. Overnight at the Storfjord Hotel in The Fjords and Trondelag. Take the opportunity to visit Ålesund, a picturesque town with much to offer visitors. Start your tour at the Jugendstilsenteret which tells the story of 23 January 1904, when a fire ripped through the town and destroyed 800 homes. After the fire, Ålesund rose like a phoenix from the flames and is today regarded as one of the most impressive Art Nouveau towns in the world. After breakfast, travel to the island of Smøla. En route stop at the coastal towns of Molde and Kristiansund and take a drive along the Atlantic Road. The Atlantic Road is a combination of 8 low bridges, which cross the Atlantic, connecting an array of small islets between Bud and Kristiansund. Overnight at the Smola Havstuer in The Fjords and Trondelag. Days at leisure on the island of Smøla. Largely undiscovered by international tourists, the island - with its moor-like scenery and rocky skerries - stands in complete contrast to the mountainous mainland that forms its backdrop. After breakfast, drive inland to another hidden gem. Your accommodation is a historic timber-trading house that has been transformed into a boutique hotel of the highest standard. The location, on the shores of the Tingvollfjord, is tranquil and the fjord views, uninterrupted and calming. Overnight at Angvik Gamle Handelssted in The Fjords and Trondelag. Day at leisure. Opportunity to enjoy and experience the Tingvollfjord, a quiet and lesser-explored part of the fjord region. Overnight at Angvik Gamle Handelssted inThe Fjords and Trondelag. Amid thousands of acres of protected forest, in the village of Glomset and high above the fjord of which it takes its name, is the Storfjord Hotel. Tradition and luxury combine to provide a fairytale stay in one of Western Norway’s finest hand crafted ‘Lafta’ hotels. One hour's drive north from the coastal town of Kristiansund lies the island of Smola. With a landscape which completely contrasts with the mountain peaks and fjords of the mainland, Smola offers a gentle moor-like scenery interspersed by rocks and lakes. One hour's drive north from the coastal town of Kristiansund lies the island of Smola. With a landscape which completely contrasts with the mountain peaks and fjords of the mainland, Smola offers a gentle moor-like scenery interspersed by rocks and lakes. The main road, which circles the island, hugs the coastline and views to the Atlantic, across skerries, islets and red boat huts are never far away. At every turn the view changes, on the east you can see the mountains of the mainland on the horizon, to the north the road has the water on both sides and to the west, calm bays can be enjoyed. Largely undiscovered by international tourists, Smola will provide a different insight to the Northern Fjord region. Stay here for 3 nights and feel yourself unwind in its tranquillity. Smola Havstuer is located in the small hamlet of Raket on the west coast of the island. This recently renovated sea house has uninterrupted views of the Atlantic and the archipelago. It's nine, simply decorated guest rooms enjoy a water view as does the lounge/dining room and outdoor terrace. It is easy to sit here for hours just enjoying the view change with the weather. To stay at Smola Havstuer is to slow down, breathe in the fresh air and enjoy the nature, it is an oasis of calm. 9 rooms, divided between two buildings, and with bathroom (shower), TV and Ocean view. Some rooms are located on the first floor and accessed by steps, help with your luggage is available. The island is connected to the mainland by a ferry (20-minutes journey time). The ferry costs c.97NOK for a car and driver plus c.36NOK for each additional passenger.